Figuring out how to incorporate the Common Core State Standards (CCSS)—not to mention the extended standards that many states have implemented—into intervention activities is enough to make most SLPs’ heads spin. But SLPs must tie intervention to the standards to create educationally relevant intervention that helps students succeed in the classroom. In this session, Perry Flynn will review the standards and give participants ideas for intervention activities that are tied to CCSS-based classroom lessons, focusing on—but also going beyond—English Language Arts Speaking and Listening Standards. 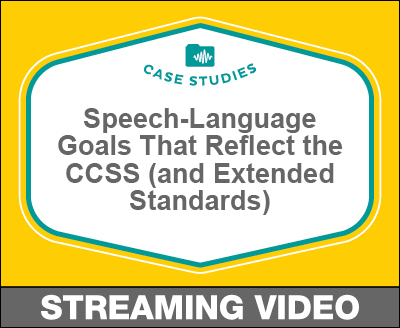 You will walk away with ideas for CCSS-related goals that fit various levels of comprehension and an outline with the key elements of clear, standards-based IEP goals.